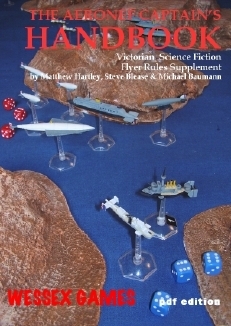 A set of Victorian Science Fiction aerial combat rules rules written by Matthew Hartley and Steve Blease for use with 1/1200th scale miniatures. Aeronef is a set of wargames rules allowing you to fight battles of aerial warfare in the last decades of the 19th century. A simple game to play, yet challenging to master. Includes: the basic rules for aerial combat between Negative Gravity and R-Matter powered aeronef and lighter-than-air aerostat; an optional complete geo-political and scientific timeline from 1852 to 1899; optional rules for players to expand the game to include bombing ground targets, anti-aeronef "archie" fire, fixed-wing craft and taking off and landing; military review of the Great Powers aeronef capabilities; full design and modification rules for players to create their own perfect craft and four introductory scenarios set during the Great War of 1889-91, all with details of and stats for the craft involved. Pages: 18 A4 inc cover. 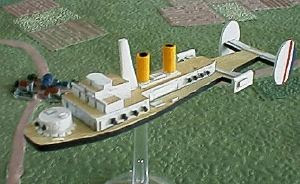 To buy Aeronef go here. 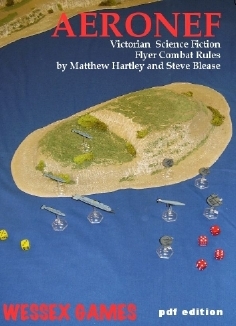 The Aeronef Captain's Handbook is a supplement for our popular VSF flyer combat rules Aeronef. Includes: rules for introducing Martian aeronef into your battles with their new gas and electric weapons; an expanded geo-polytical and scientific timeline from 1899 to 1911; optional rules for players to expand the game to include air torpedoes, boarding, morale, multi-targeting, ramming and towing; Aeronef strategic game rules to allow you to play mini-campaigns; technological development timeline to reflect design improvements through the period; rules to include aerofauna on Earth and the colonised planets and four new scenarios featuring the new rules and craft in this handbook. Please note The Aeronef Captain's Handbook is a supplement, not a stand alone product and you must own Aeronef to be able to utilise this product. To buy The Aeronef Captain's Handbook go here. Aeronef Over The Aegean: Wrath Of The Syren is a mini-campaign for Aeronef but can be used with other VSF flyer game systems or the protagonists changed to accommodate your own Aeronef fleets with a little effort. 1890: Following the death of his family during an Ottoman aerostat raid, Hungarian noble Baron Lantoz launched a campaign of revenge and terror on those responsible. Utilising the ingenuity of Professor Vanvlak to upgrade his flagship, the Syren, a series of raids where launched across the Aegean targeting the 3rd Akinjli Squadron and its commander Carpik Pasha. Aeronef Over The Aegean: Wrath Of The Syren recreates this legendary campaign as Baron Lantoz and the Syren wreak havoc across the Aegean and the Ottoman aerial fleet tries to stop them. All of Wessex Games' royalties for this product are donated to charity. Pages: 16 A4 inc cover. 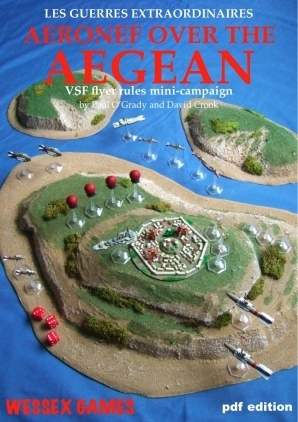 To buy Aeronef Over The Aegean go here. Our Aeronef miniatures line is unfortunately currently out of production, however the good chaps at Brigade Models produce a very large official range of miniatures for the game which can be purchased here.